The new vehicle electronics are here to stay. It’s very important that we learn how they work and what they do. The repairs and required procedures for operation must also be learned and followed. Nobody wants to put a vehicle deemed not completed or unsafe back out on the road – that we all agree on. We need to make sure we’re all talking the same language. The phrase, “scan to cover all diagnostics,” is being heard a lot in our industry. This creates a problem, as a recalibration or a reprogram is not a scan. There is a huge difference between them. If I do not disconnect it, I do not need to scan or recalibrate the system. There are levels of access that are available through the OBD port. It all depends on the tools being used. A scan is a low-level diagnostic designed to read codes that are set by the vehicle as to faults that have occurred. A little higher level is the clearing of codes. Recalibration is at the highest level of access to vehicle electronics. Here we have access to vehicle programming and can rewrite if access is there. A recalibration is a resetting of sensors to be sure they are not out of “focus.” You can have a functioning system and still not function correctly, as the sensors are not aimed or recalibrated to detect what they were designed for. If you’re reading this, you’re not blind, obviously. If you go to the eye doctor and are tested and it’s found that you need glasses, when you put on the glasses, you now see clearly what you’ve been missing. Now you’re recalibrated. The recalibration would be the difference between a vehicle stopping in front of a child who suddenly crosses the street or not stopping. It’s the reaction time that’s critical. A scan cannot tell if the system is aimed correctly, but a recalibration does do a scan. Most scanning equipment available today can’t do recalibrations, as they provide a totally different level of functions. Most recalibration equipment requires a laptop with dedicated software and external sensors or a target board to do a static test. The dynamic test involves hitting the road for a period of time. There is no one tool currently available that can scan and/or recalibrate all vehicles. required. Note that recalibrations are required if stated, not an option. Some vehicles can calibrate themselves, but most do not. It’s too bad this is not true. A technician may have been trained, but the equipment may not have been purchased yet or the service writer or manager may not have enough background to know what needs to be done. On many occasions, you literally have to go into dealerships, look up the procedures and teach them what’s required for recalibrations. Be sure to look up procedures and let them know you’re sending for a recalibration, not a scan – those are two different procedures. Driving a vehicle and determining that it seems fine is not a test for proper operation of electronic systems. Mandatory recalibrations are performed to aim the components and be sure they detect what it’s their job to detect. You can have a totally functional system and still be blind. The light on the dash is for the owner to alert them that service is needed right away. DTCs do not always present a light; they’re just detecting abnormalities and recording them. If a serious abnormality arises, then the light will present itself to warn the driver. 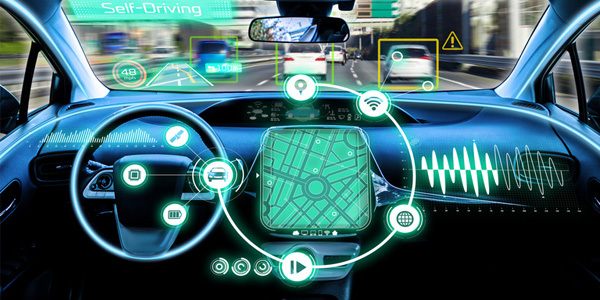 Many sensors are designed to work a specific point of a vehicle. When the part is removed or misaligned due to collision and/or repairs, we must be certain that the sensor is realigned to the parameters required. Just because you did not disconnect the part does not mean it’s aimed correctly from the trauma of the crash or work performed. This also applies to the statement, “Well, I disconnected the battery first then put it back together and hooked the battery up.” You still have to be sure all is aimed and aligned properly. Glass techs tell shops, “Just let the camera on the glass hang by the wires. That way when it’s put back on the glass, it’s ready to go.” So the question is this: If the bracket is incorrectly mounted 1 mm in any direction or the new windshield is set 1mm too low, how will that affect a camera 100 feet down the road when it tries to see a stop sign or pedestrian? This also applies to the R&I of bumpers and other components. If improperly aligned, the sensors will be restricted or blind in function.